First-person narrator Julia is a crank! I saw someone blogged about her being fatphobic, but IMO, she is just a hater. I'm so much like Edna--nothing satisfies me, nothing makes me happy. I want too much out of life. I want to take it in my hands and squeeze and twist as much as I can from it. And it's never enough. That's Edna of The Awakening, one of Julia's favorite books. Julia is a reader and aspiring writer growing up in Chicago with immigrant parents who didn't finish high school and a recently-deceased sister who went to community college for four years without earning an Associate's degree. No one understands Julia, not even her one friend, Lorena, who is also planning to go to community college when she finishes high school. Julia does have one guy supporting her dream to go to a good four-year college or university, her English teacher, who is maybe a little bit woke. "See, I'm teaching you standard English, which is the language of power. What does that mean?" Mr. Ingman raises his eyebrows and looks around the room. "Anyone?" Then he talks about speaking with authority, but not having to give up slang, like "on fleek." Adorbs. Mr. Ingman keeps after her--about how she's doing after her sister dies, how her applications are coming along. He's a good egg, but not a white savior, thank goodness. It's nice that there are moments when Julia is not bitching about everything she hates, like when she goes to a museum to see another one of her teachers's paintings. I love art almost as much as I love books. It's hard to explain the way I feel when I see a beautiful painting. It's a combination of scared, happy, excited, and sad all at once, like a soft light that glows in my chest and stomach for a few seconds. Julia is so much like a certain friend of mine she breaks my heart. I want her to be happy, but also love her prickly self. Maybe she feels the same way. She has her moments when she tries to reel the cactus spines in. Lol, what a huerca. 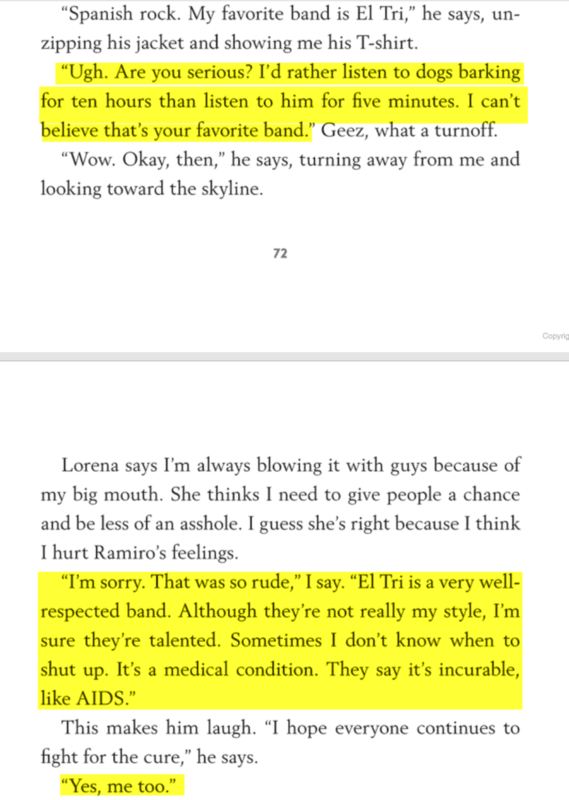 Btw, there's lots of vernacular Spanish in the book, some of it translated, some not. There are a bunch more sections I highlighted, but I'll leave you with this other on-brand Julia observation. There's a dead donkey in a field behind a barbwire fence. Its legs are bend and stiff, and its mouth is open, as if it had been smiling when it died. Two vultures circle above it.